The sun is going down earlier and earlier as Autumn takes over and the earth moves away from the sun, which means more chances to shoot stars! As soon as the sun sets, night photography begins, and on this particular warm evening our photography workshop group had some great conditions for learning the ins and outs of long exposure photography. With full attendance, at 7:00pm we started our orientation at the Aperture Academy Gallery. You can't beat it for a fantastic place to meetup and start a workshop. It's a 4,000 square foot fine art photography gallery as well as classroom and venue. During orientation we spent the first 30 minutes getting to know one another, talking about our gear and walking through the plan for the evenings shoot with a multimedia presentation. We talked a good bit about the wide variety of settings we'd be using with our various DSLR cameras for best results in shooting the night sky during this time. Later, with the night sky fully upon us, it was time to load up and head south out of San Jose and toward Almaden Valley where the night sky is a good bit darker so that more stars will be visible. As soon as our tripods were stable, and our cameras were set up, we immediately started working on composition and how to focus in the dark of night so that we would be sure to get sharp images during our long exposures. As soon as we began with some high ISO tests it was immediately apparent that the Milky Way was visible on this night! Everyone was getting shots of the cloudy elements of the outer band of our spiral galaxy and pin point stars right off the start. Jean and I were very impressed with the quick way in which our students were getting brilliant results! We then started playing with lower ISO and longer exposures to create star trails. First we did some two minute exercises and then some that were five minutes long. Next, we started with light painting exercises using just a flashlight...this is a lot of fun and really teaches you how your camera can do some surreal stuff in the dark of night, and how the sensor reacts to light of various intensities. After the light painting, it was time to do some real long, long exposures of ten minutes. 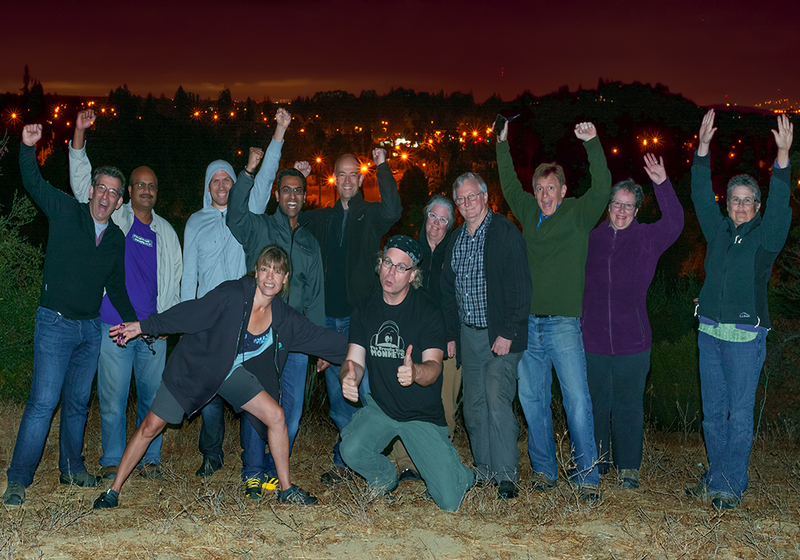 While the cameras were all open and taking in the night sky, we had a chance to talk over some of the principles of night photography and to get to know one another a bit better. The results were fantastic, not only because of the star trails we were able to capture but because of the streaking clouds that were coming into view in the images. It created a dramatic feeling that was great to see our class getting. Everyone was happy to see the results! We then showed the class what you could do with a colored lights app on a Droid smartphone in a mere 30 seconds. It was a lot of fun and laughs as we saw the resulting abstract art on our back screens. Then to wrap things up, our class lined up for one go at getting a ten minute long exposure for everyone. This time the clouds were very much upon us, but the stars were very visible. This would mean some very interesting results were waiting at the end of our wait. Sure enough, everyone was marveling at the images they were getting with the new skill sets they achieved in our class just as it was becoming time for us to all pack up, travel back to the Aperture Academy, and say our goodbyes. Jean, Matt and the rest of the team at Aperture Academy!